The Desert Alchemy Flower Essence Photo Book is a feast for the soul. It is a quick starting point for understanding the healing power of 119 desert flower essences. It contains a color photograph of each flower as it grows in nature. It also includes descriptions of the harmonizing qualities and the patterns of imbalance of each flower essence, making it a handy reference. Whether you use flower essences professionally with clients, friends, pets, and animals, or use them for self-help, this book is a go-to for quickly understanding the core of their use. 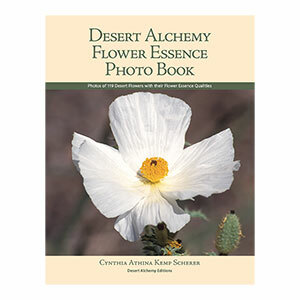 Based upon over thirty years of research by Cynthia Athina Kemp Scherer, the Desert Alchemy Flower Essence Photo Book is easy to use and gives an instant transmission of healing qualities through the intimate view of the photographs. Cynthia Athina Kemp Scherer has been a pioneer in flower essences since 1983. She is the founder of Desert Alchemy, in Tucson, Arizona, USA, and co-creator of desert flower essences from the Arizona deserts. She is an international seminar presenter and the author of The Alchemy of the Desert, The Art & Technique of Using Flower Essences, the Desert Alchemy Expanded Cross Reference, The Essence of Self-Empowerment, and The Core Issue articles at www.Desert-Alchemy.com.